If you suffer from flat feet, you may experience discomfort or pain, but you don’t have to deal with it anymore. The expert podiatry care team at Great Lakes Foot and Ankle Institute PC in Chesterfield, Clinton Township, Fort Gratiot, East China Township, Shelby Township, and Rochester, Michigan, can help you overcome flat feet in a natural way. Book your appointment through the online tool or call the office today. Flat feet, also called fallen arches, means you don't have a normal foot arch. When you're a baby and toddler, you don't have a foot arch yet. Once you start standing and walking, your arch usually develops gradually. However, for some adults, the arch never develops. Alternatively, you can have a foot arch that falls due to other conditions. There are two general types of flat feet, flexible flat feet, and rigid flat feet. When it is flexible flat feet, your feet seem to have an arch until you stand up. In rigid flat feet, you don't have a visible arch either lying down or standing. Flat feet usually develop with pronation, which means your ankle bones turn inward. Pronation is especially common in children. Flat feet in adults may be connected to a disease or illness. For example, rheumatoid arthritis can wear down the cartilage and ligaments in your foot, which then causes your arches to sink. Diabetic nerve damage, posterior tibial tendon damage, and sudden leg or ankle trauma can also cause flat feet. Flat feet may be hereditary, as well. How does the doctor diagnose flat feet? Your Great Lakes Foot and Ankle Institute PC podiatrist will evaluate your feet in several ways. First, you'll discuss whether you're having any symptoms like foot pain or easily tired feet. Your podiatrist checks your leg and foot movement by having you stand on your toes and perform other basic movements. Additionally, your podiatrist does a hands-on exam to check your tendons and muscles. Your podiatrist may also examine the shoes you wear the most often to check the wear patterns. Finally, your podiatrist may use foot X-rays to see your bones and joints to help in making a definitive diagnosis. In severe cases, you may need surgery to correct flat feet, especially if an underlying condition has caused tendon, ligament, or bone damage in your foot. 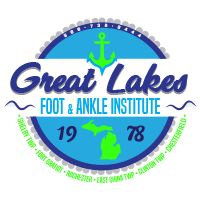 Use online booking or call the Great Lakes Foot and Ankle Institute PC location nearest you to schedule your appointment now.